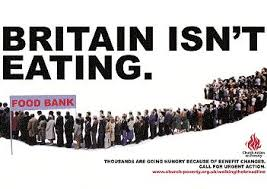 This Christmas more people than ever will be relying on food banks in the UK. Despite the government's talk of a recovery, thousands of people across the country are going into the Christmas period with the grinding desperation of poverty and hunger hanging over them. In my report, Hungry Christmas, I've exposed a huge increase in the number of people relying on food banks in South East England. The region - the second richest in the UK - has seen a 60% increase in the number of people relying on emergency food handouts this year and the total number of those needing emergency food handouts is likely to hit 70,000 for the year April 2013- April 2014. These statistics are shocking enough, but behind each statistic is the story of someone who is living in the sixth largest economy in the world yet struggling to feed themselves and their family. This year I've toured my constituency visiting the food banks which are straining to keep up with rising demand. It's at these food banks that I've met people like John. He was now volunteering after receiving help from the food bank at a time in his life when he had lots of problems. By degrees he'd lost his good job, his accommodation, developed a drug habit and drifted into street drinking, until his life was in a very dark place. He told me he thought that a lack of food was the least of his worries: he could always scavenge or beg. But he realised that he eventually needed to get back to a 'normal life' and regular meals, or he would die. I also met Mary*, a single parent who just can't keep up with the expense of clothing and feeding her children, and often goes without food herself so her kids can eat. For her, the food bank was a lifeline at a time of desperation. The two major reasons people give for going to food banks are benefits problems (delays, sanctions and changes) and low incomes. There's evidence to suggest that the former has been exacerbated by the government's 'crackdown' on benefits claimants and their changes to social security. The latter reason, which explodes the myth of people being able to 'work their way out of poverty', reflects the fact that wages have stagnated in real terms for a decade now. This Christmas many of us will be giving a bit of our money to the many good causes who help those in need. But, while charity is essential for assisting the vulnerable, it's vital that we don't let ourselves slip into thinking that the poverty so many of us face is inevitable or uncurable. In twenty first century Britain nobody should have to rely on handouts to get by at Christmas time, and no government should be allowed to get away with letting this situation develop. If we are to tackle the poverty faced by so many in the UK we need to ensure that people have access to jobs which pay enough to build a life on and adequate social security protection when times are tough. Let's make sure that the good yuletide feelings don't let us forget or forgive this Government for passing on a financial crisis to the poorest in society. And let's ensure that in 2014 we say to this government loud and clear that poverty in this country is a result of their politics, and we won't stand for it anymore.